The NBCFP is a provincial chapter of the College of Family Physicians of Canada. We are a professional association whose members are family physicians, and our role is to provide the standards for the training, certification and continuing education of doctors who specialize in family medicine. 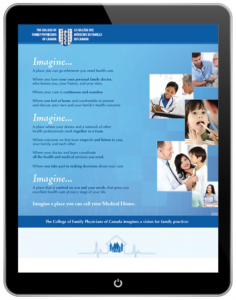 We also advocate for family doctors and their patients, and promote the importance of family medicine, through communication like this website. Family physicians are specialists trained to treat the whole person. After completing our undergraduate medical degrees, we have completed a two-year residency in family medicine. We are experts at offering care for all parts of the body and mind, all diseases, in all ages and genders, including preventative health care and primary mental health care, as well as the treatment of most illnesses and injuries. The doctor-patient relationship is at the centre of family medicine. We view ourselves as partners with our patients, and will work with you throughout your life to manage your health. Your family physician may work in a solo or group practice or as part of a multidisciplinary team with other health care providers. If we are not able to provide the care you need in our own practice, we will arrange specialized care for you. After we arrange a referral, we will coordinate with the specialist to ensure they have pertinent information about your medical history, and provide any follow-up treatment you may need. As your primary health care provider we will also maintain your medical record throughout your life and may communicate on your behalf with other care providers you are seeing, with your permission. Where do Family Physicians work? Specialty clinics for maternity, travel medicine, cancer, diabetes etc. What is the Patient Medical Home (PMH)? Imagine a place you can call your Medical Home. The Patient’s Medical Home is a model based on your health care needs. The first pillar of the Patient’s Medical Home is patient-centredness, which means your family physician and other members of your health care team are responsive to your needs, preferences, and experiences. The team at your PMH will work to help you better understand areas of your health that need further attention and will seek your input on your care, to improve your health. To find out where the New Brunswick and other Canadian provinces are with this concept, click here.